A few years back we were remodeling, we’ve almost recovered from the trauma so I’m hesitant to even mention it, BUT it’s relevant, while our kitchen was completely torn out we, of course, had a birthday come around. It wasn’t planned that we wouldn’t have a kitchen or even an oven to use at that point, it just happened that way. And while remodeling you roll with things; tear out the entire kitchen, YES I WILL DO IT NOW! So birthday boy, no kitchen, yet still in need of a cake, was feeling a little sad. 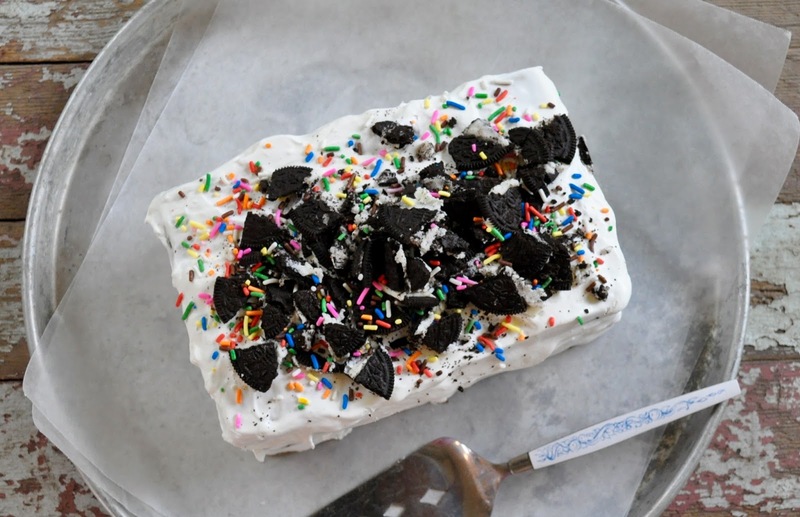 I turned to an easy to make, no bake (duh) ice cream cake to solve the dilemma, and while the guilt was laid on thick, it was a popular cake(ish). So come this year, we’re not remodeling, while the almost 10-year-old was deciding what kind of cake he might want for his birthday, he fondly remembered that cake and asked for it again. I agreed to it because it was pleasant to make and eat. But then I got this recipe book in the mail from Kroger with an entirely different kind of easy to make ice cream cake and I decided to make that instead. 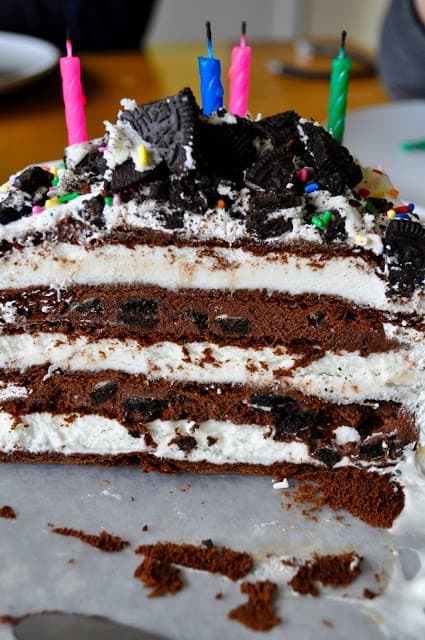 The original recipe included peanut butter sandwich cookies, Nutter Butters I’m assuming, but the birthday boy doesn’t like peanut butter so I subbed in Oreos because who doesn’t like those? It was even tastier than the last ice cream bar cake but it does require a little bit more work, like warming hot fudge sauce. Actually, the hardest part for me was making room in the freezer for the cake to freeze overnight, thank you abundant salmon harvest. 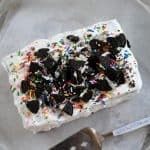 I have two other interesting Ice Cream Cakes on the blog if you’re interested in them. 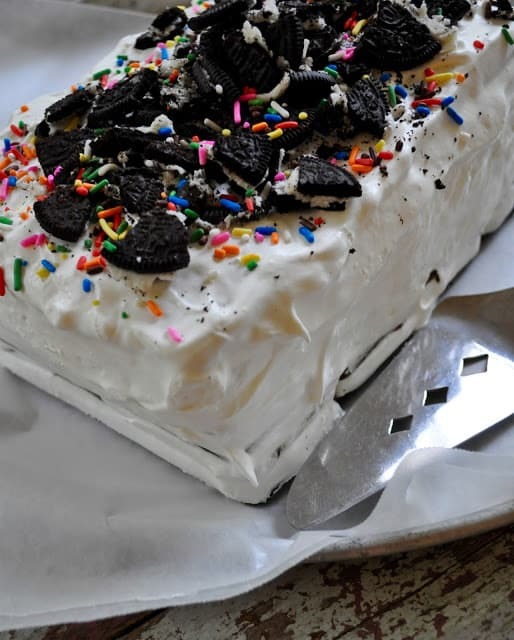 First I have this amazing cake made with ice cream bars and caramel sauce and I have this Ice Cream Cake Roll. Both fun twists on cakes for parties. Wow, decadent!! I think my boy would want this if he saw it, birthday or not!! Pinned for his next one.